Director – Andrew Chen, Screenplay/Producer – Tsui Hark, Music – Ricky Ho. Production Company – Film Workshop Co, Ltd. The young tax collector Ning inadvertently travels into the land of the dead. Realising that he does not belong there, he uses makeup to hide himself amongst the ghosts. He is befriended by the beautiful Shine, not aware that she has been sent to return with a human soul for the tree spirit Madame Trunk to devour so that she can rejuvenate her aging skin. At the same time, the afterlife realm is attacked by Red Beard who rampages through the town, being fought back by the warrior monks White Cloud and Ten Miles. Fleeing with Shine, Ning makes a return to the human world but must hide her lest the touch of sunlight causes her to disintegrate. She tries to prevent him being devoured by Madame Trunk. The two try to escape the conflict around them and get to the afterlife’s Reincarnation Gate so that she might return to be reborn in a human body. The Tsui Hark-produced A Chinese Ghost Story (1987) was an enormous hit in Hong Kong. Its unique blend of traditional Eastern beliefs, martial arts and supernatural fantasy caught on in a big way and had a great deal of influence over the Hong Kong fantasy genre in the decade ahead. There were two likeable sequels A Chinese Ghost Story II (1990) and A Chinese Ghost Story III (1991), plus a subsequent remake A Chinese Ghost Story (2011) that should be buried and forgotten somewhere. And then there was this oddity – an animated spinoff of the franchise. 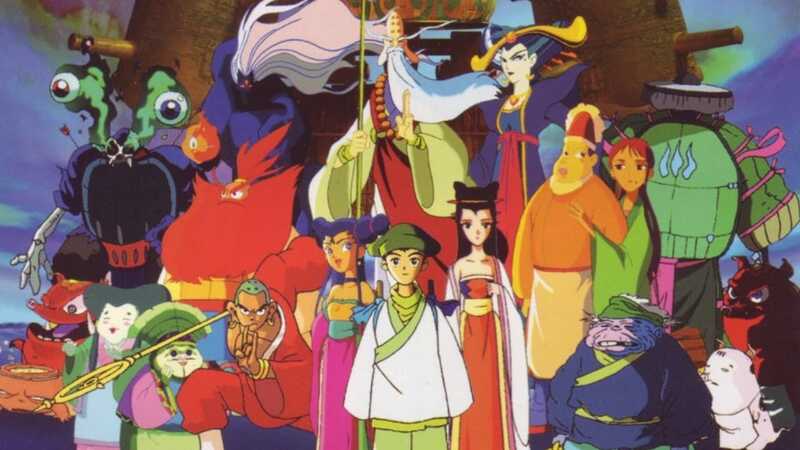 As the title clearly states, A Chinese Ghost Story: The Tsui Hark Animation is written and produced by Tsui Hark, the legendary Hong Kong director and producer, responsible for films such as Zu: Warriors from the Magic Mountain (1983), Once Upon a Time in China (1991) and the Detective Dee films, and who acted as a producer on all the original A Chinese Ghost Story films. (See below for Tsui Hark’s other genre films). This is a loose rehash of the first film, using the same plot of a lowly tax collector named Ning who inadvertently strays into the realm of the dead where he becomes attracted to a ghost girl, unaware that she has orders to capture him for a madam of the underworld, and much toing and froing that ensues as tries to save her soul for reincarnation so they can be together. The two films follow broadly the same path, although there are also a great many individual differences. The disappointment of A Chinese Ghost Story: The Tsui Hark Animation is that it is made with fairly ordinary animation – nothing standout – although there are a few scenes that venture into the then very new and emerging field of computer animation. The downside of this is that when the usual wall-bouncing, mid-air acrobatics and power blasts of the live-action A Chinese Ghost Story films is rendered in animation, the result looks for all the world like just a regular piece of teen superpowered anime that is regularly churned out from Japan. That said, this is a Tsui Hark-written film and soon in it starts to become entertaining for its visual wildness. There are the scenes where Ning has ventured into what he only just starts to realise is an afterlife town – somewhat reminiscent of the subsequent Spirited Away (2001) – and realises he has to hide among the other ghosts by disguising himself and using makeup to create a sickly pallor. There are some undeniably imaginative sequences – the venture aboard the Reincarnation Train, a train shaped like a caterpillar that snakes a course through the sky nightly; Ning falling back down to the corporeal world with Shine where she is in danger of being burned up if the sun touches her and he is forced to shade her with his body until he can get her into the nearby lake; the attack by Red Beard aboard what looks like a giant Transformer made out of bamboo barrels. The film gets particularly inspired towards its climactic scenes where Ning hatches an ambitious plan for he and Shine to go through the Reincarnation Gate and both of them be reborn, while avoiding the hammers that come down on all sides to wipe out their memory, which involves a fight between all of the warring parties aboard the Reincarnation Train and a tense race to get through the Gate before it closes, The result is an animated film filled with charm and considerably more imagination than in almost every English-language animated film that was being made around the same time. Tsui Hark’s genre films as director are:- The Butterfly Murders (1979), We’re Going to Eat You (1980), Zu: Warriors from the Magic Mountain (1983), Aces Go Places III: Our Man from Bond Street/Mad Mission III: Our Man from Bond Street (1984), Green Snake (1993), Butterfly Lovers (1994), Zu Warriors/The Legend of Zu (2001), Black Mask 2: City of Masks (2002), Missing (2008), Detective Dee and the Mystery of the Phantom Flame (2010), Flying Swords of Dragon Gate (2011), Young Detective Dee: Rise of the Sea Dragon (2013), Journey to the West: Demon Chapter (2017) and Detective Dee: The Four Heavenly Kings (2018). Tsui Hark has also produced A Chinese Ghost Story (1987), The Laser Man (1988), Roboforce/I Love Maria (1988), A Chinese Ghost Story II (1990), Swordsman (1990), A Terracotta Warrior (1990), A Chinese Ghost Story III (1991), The King of Chess (1991), New Dragon Gate Inn (1992), Swordsman II (1992), Iron Monkey (1993), The Magic Crane (1993), Swordsman III: The East is Red (1993), Wicked City (1993), Burning Hell in Paradise (1994), Black Mask (1996), Master Q (2001), Vampire Hunters/The Era of Vampires (2002) and The Thousand Faces of Dunjia (2017).